A. Poliakoff, Serge Poliakoff, Catalogue Raisonné, Vol. IV, 1963-1965, Paris 2016, Addendum, p. 57, no. 62-186 (illustrated in colour). 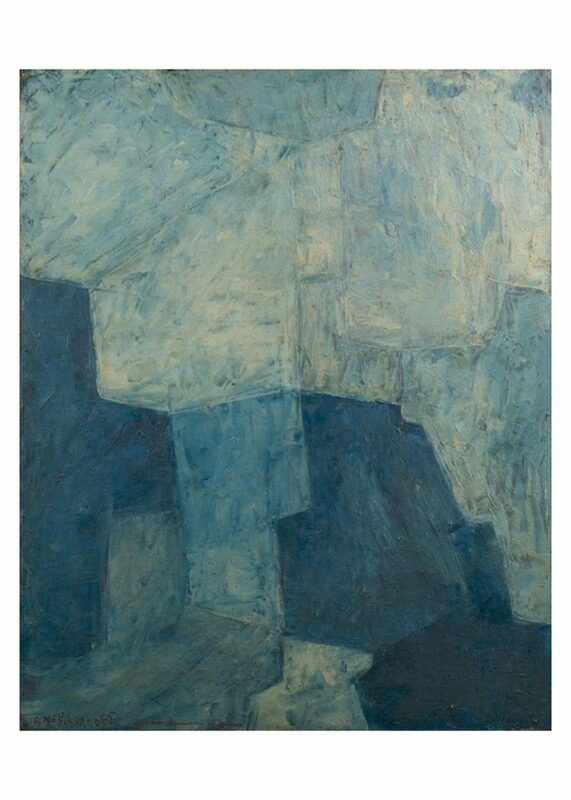 In the early 1960s, Serge Poliakoff – then at the height of his powers – painted a series of canvases in tonalities of blue and grey that stand out as some of the finest of his production. The present Composition Abstraite certainly figures as one of the very best achievements of this series. Its large, rectangular format enhances the rhytmicality of its powerful, trapezoidal patches of colour, whilst the sanguine preparation barely discernible beneath the surface gives it a warmth that is absent from other, paler works of the time. The painting offers an excellent example of Poliakoff’s expert compositional skills, the lower, darker half of the painting forcefully contrasting with the lighter hues of the upper part, thus beautifully enhancing its verticality whilst expressing the complementary forces of its asymmetrical colour fields arranged along a vertical axis and achieved with several layers of forceful brushstrokes. Born in Moscow of a devout mother and a horse-breeding father, who supplied the Czar’s cavalry, from an early age Serge Poliakoff displayed a keen musical talent and an attraction for Orthodox devotional art. Having enrolled at the Moscow School of Painting during the First World War, he was however forced to flee the Russian Revolution in 1917. After some peripatetic years, which saw him travelling from Constantinople to Vienna and Berlin, in 1923 he settled in Paris, all the while earning his living as a musician, and in 1929 joined the Académie de la Grande Chaumière. In 1935, he relocated to London, where he attended the Slade School of Art, and where he discovered the colours of Egyptian art in the collections of the British Museum. Shortly after, upon his return to Paris, his befriending Wassily Kandinsky and the foremost couple of avant-garde Abstract Art, Robert and Sonia Delaunay, marked a powerful shift in his style, which until then had been figurative, and which now concentrated on the emotive potential of colour and its contrasts. At the Delaunays’, Poliakoff also met and became friends with the German painter and sculptor Otto Freundlich (1878-1943), of the first generation of abstract artists. But the most significant and enduring influence on Poliakoff at this time was probably that of the couple’s close friend Joseph Lacasse (1894-1975), who had already experimented with Abstraction. His work, focused on representations of light and energy and overtly metaphysical, genuinely resonated within Poliakoff’s aesthetics, on which the contemplative and ultimately spiritual character of Russian icons had left an indelible mark (fig. 2). Poliakoff’s first abstract painting premiered at the 1938 Salon des Indépendants. In 1945, the Parisian Galerie L’Esquisse devoted him a solo exhibition of his work. In the years of the Après Guerre, he became a central figure of the “new” School of Paris, alongside Jean Dubuffet, Hans Hartung and fellow émigré Nicolas de Staël. By the 1950s, following a series of important exhibitions in Paris and abroad, Poliakoff had become widely considered one of the most powerful painters of his generation. In 1962, coinciding with his acquisition of the French citizenship, a room was dedicated to his paintings at the Venice Biennale. A forceful personality, the artist mingled easily with the French community of artists and dealer, but always retained his unmistakably Russian origins. Like some of his best canvases, the present Abstract Composition is invested with a composed and lyrical pictorial language accentuated by soft contrasts and avoidance of symmetrical or overtly geometrical forms. Such harmonious forms are here juxtaposed simply by the use of colour, seen as an emotion, with outlines reduced to a minimum. Composition Abstraite marks a return to more subdued tones after the rich colours of his 1950s canvases (fig. 3). One of the most original figures of 20th century art, Poliakoff may be compared and contrasted to contemporary figures of American Abstract Impressionism. On the one hand, in accordance with Parisian abstraction Poliakoff saw space as contained within the tableau; on the other (together with the other great colourist de Staël) he shares with Mark Rothko not only a similar life trajectory as a Russian subject in exile, the unrelenting interest for colour as a metaphor of human emotions (fig. 4). Poliakoff’s consummate technique, honed by repetition and experimentation, remains deeply linked with the art historical and historical past of Russia and Europe. His reputation steadfastly growing, his works are included in prestigious private and public collections on both sides of the Atlantic, such as the Centre Pompidou, Paris, the Kunstmuseum Basel, the Museum of Modern Art, New York, and the Solomon R. Guggenheim Museum, New York. In 2014, the Musée d’Art moderne de la Ville de Paris devoted to the artist a long-overdue retrospective.